Abortion rights groups have taken differing stands on the healthcare bill, with NOW decrying it and Planned Parenthood optimistically looking forward to changes. But one thing's for sure: abortion is back in the spotlight. In the Wall Street Journal, Laura Meckler finds evidence to confirm what many suspected: that the need to keep abortion-related funds separate from all other money as per Obama's executive order will cause insurers to drop abortion coverage entirely. A spokesperson for insurance company WellPoint called the process of segregating funds "nightmarish," and said there would be no market for policies with abortion coverage. And a letter from nonprofit insurance company Affinity Health Plan stated that the costs of keeping the money separate would dwarf any revenue companies made from covering abortion. Abortion rights groups, understandably, are angry. NARAL has criticized the fund segregation requirement, saying it creates an "an unacceptable bureaucratic stigmatization" of abortion. NOW goes farther, also noting the bill's lack of a public option and the fact that it gives permission for some employers to charge women more for insurance. Says NOW president Terry O'Neill, "women as a whole are worse off with this bill than they are with the status quo." Planned Parenthood, however, thinks it can still convince Obama to modify the bill's requirements for abortion coverage. Says Laurie Rubiner, Planned Parenthood's vice president of public policy, "We're going to try and work with the administration in order to make this the least cumbersome as possible. There are ways through the regulatory process that we could ease some of these administrative processes." Planned Parenthood won't give details, to avoid tipping its hand, but it's a little hard to see how this would work, especially given how contentious the abortion issue was in the healthcare debate. Will Obama really be willing to budge on a compromise he painstakingly forged over "multiple one-on-one personal conversations" with anti-abortion Democrats? Will he do so when even the current language of the bill has some anti-choicers crying "betrayal" (not to mention "baby-killer")? 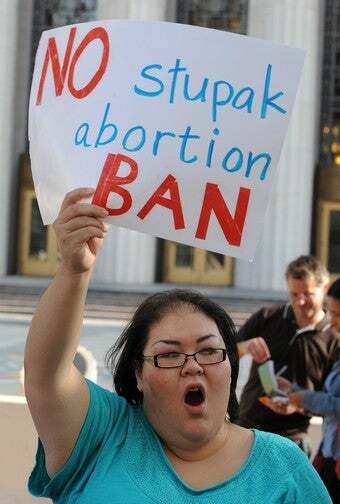 Bart Stupak continues to take heat for not sticking to his initial, stronger demands for a ban on any coverage for abortion by plans that take federal money — Susan B. Anthony List President Marjorie Dannenfelser says, "Stupak has not only failed to stand strong for unborn children but also for his constituents and pro-life voters across the country." Stupak faces criticism from the other side too — EMILY's List President Stephanie Schriock says, "Pro-choice Democratic women led the fight against the anti-choice forces led by Bart Stupak" — and it's somewhat ironic that he's being demonized as an extremist by the two opposing forces between which he offered an (admittedly unpalatable) compromise. Politico's Alex Isenstadt writes that "the abortion issue is poised to make a political comeback, returning the familiar wedge issue to the campaign trail after a brief hiatus," and indeed, midterm elections may see Stupak challenged by both a pro-choice Democrat and a conservative Republican. If healthcare reform does lead to a re-polarization of the abortion debate, it'll be a sobering reminder that despite talk of bipartisanship, abortion reduction, and the like, women's reproductive rights are an area where compromise has been nearly impossible to strike.